Pat Farmer is an extreme ultra marathon runner, achieving historic and world record breaking runs through some of the most inhospitable conditions known. His physical and mental achievements have put him in the company of the world’s greatest adventurers, such as Sir Edmund Hilary, Robert Falcon Scott, and Thor Heyerdahl, and is possibly the world’s greatest runner. Not only his running is exceptional, but also his humanitarian effort, raising millions of dollars for Lifeline, Cancer Council, Australian and International Red Cross, and Diabetes Australia. It is Pat’s story to tell, his journey to explore through the thick and thin, the dark moments and the best. Pat is truly a gifted man, and by placing one foot in front of the other he inspires a nation and demonstrates that nothing is impossible, that we can make anything a reality if we desire it. 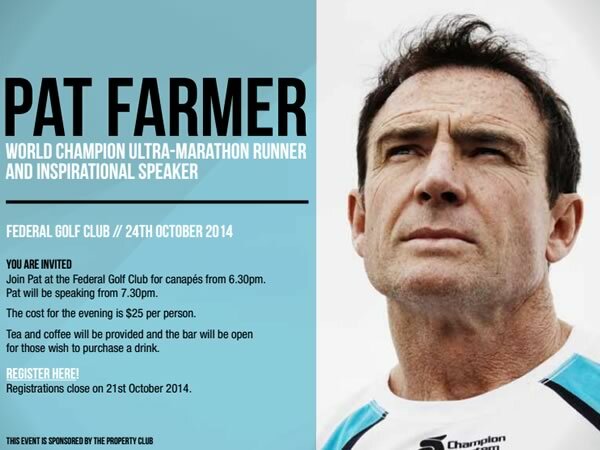 He is speaking at the Federal Golf Club on 24th October. All are welcome to attend but registration and cost ($25 per person) is necessary for catering purposes. For more information contact Ruth by emailing ruth@incanberra.com.au.